Home » This Weeks Historical Events » Historical Events (June 26–July 2): Where were the Cubs? The three major contenders for the presidential nomination at the Democratic National Convention 1932 (held at the Chicago Stadium from June 27 – July 2, 1932) were Franklin Roosevelt (Gov of NY), Speaker of the House John Nance Garner and former governor of New York and 1928 presidential candidate, Al Smith. Smith was the machine candidate. 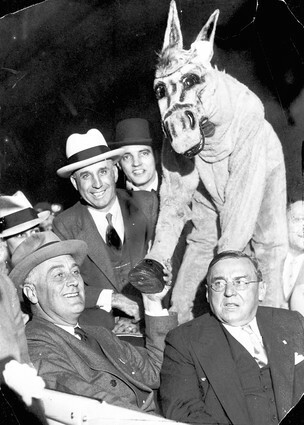 The NY Democratic machine (Tammany Hall) and the Chicago Democratic machine (run by Chicago Mayor Anton Cermak) were firmly behind the man who lost to Herbert Hoover in 1928. Cermak made sure the Stadium was packed with Al Smith supporters. Roosevelt had the support of influential Senators like Burton Wheeler, Cordell Hull, Alben Barkley, and Huey Long, who held the Deep South for Roosevelt. Roosevelt also had the western progressives, ethnic minorities, rural farmers, and intellectuals; none of which had previously been Democratic voters. Garner had newspaper magnate William Randolph Hearst behind him. Roosevelt didn’t win the 2/3 majority until Joseph P. Kennedy (father of John) convinced Hearst to get Garner to drop out and urge his supporters to go with Roosevelt. When that happened, Roosevelt won the nomination handily. A significant decision was made by the National League while the nation’s Democrats were slugging it out at the Chicago Stadium. The league passed a rule requiring all teams to wear uniforms with numbers. During the convention, these new Cubs uniforms (left) made their debut. The 1932 Cubs were a powerhouse on their way to the pennant, and now they could be identified more easily by the fans. The numbers on the backs of uniforms remain to this day, although it should be noted that many of the players on this list eventually took different numbers in later seasons. With their new uniforms, the Cubs played a three game series against the Reds at Wrigley Field, winning the first two and losing the third. Guy Bush (#14) and Lon Warneke (#17) won, and Charlie Root (#12) took the loss. They were in first place as the Democrats left town, and they would go on to win the National League pennant, before losing to Babe Ruth’s Yankees in four straight. June 26, 1963. President Kennedy gives a speech at the Berlin Wall, and says “Ich Bin Ein Berliner!” The Cubs take the lead in the top of the 14th inning against the Mets on a two run homer by Billy Williams, only to lose it in the bottom of the 14th on a grand slam homerun at the Polo Grounds in New York. June 27, 1939. The most famous scene in “Gone with the Wind” is filmed, with Clark Gable exclaiming “Frankly my dear, I don’t give a damn.” The Cubs are in St. Louis losing to the Cardinals 5-2, thanks to the pitching of former Cub Lon Warneke. June 28, 1914. Archduke Ferdinand is assassinated in Sarajevo, which eventually ignites World War 1. The Cubs are playing a double header in St. Louis against the Cardinals. They lose the opener, but come back to win the second game 8-5. Vic Saier knocks in three runs for the Cubs. June 29, 1967. Actress Jayne Mansfield dies in a car crash. Joe Niekro and the Cubs beat the Pirates 4-3 at Wrigley Field. Ernie Banks homers in the game. June 30, 1950. President Truman orders U.S. forces to Korea, officially committing America to the Korean War. The Cubs lose to the Reds at Crosley Field in Cincinnati, as Cubs starting pitcher Johnny Schmitz doesn’t record an out. Big Ted Kluszewski does most of the damage with three RBI. Phil Cavaretta and Hank Sauer homer for the Cubs. July 1, 1898. Teddy Roosevelt and the Rough Riders fight the Battle of San Juan Hill in the Spanish-American war. The Cubs (known then as the Orphans) lose to the New York Giants 8-4 in New York. Chicago is 4 ½ games behind first place Cincinnati. July 2, 1881. President Garfield is shot by Charles Guiteau in a railroad waiting room in Washington D.C. He will hang on for another 80 days before succumbing to his wounds. The first place Cubs (then known as the White Stockings) beat the Troy Trojans 10-5 at Haymakers Grounds in upstate New York. Prohibition meant the loss of hotel revenues, jobs, and a source of entertainment for thousands. The Hotel Sherman raised room rates from 50 cents to a dollar to make up for the losses. U.S. Attorney Charles Clyne vowed to support the Volstead Act (which is what it was called then). Speakers at Bughouse Square lamented “the end of our liberties.” Cars raced down Madison Street. Besotted revelers punched holes in straw boaters (hats)—as if it was New Years Eve. State Street was a trail of broken bottles the next day. At Hinky Dink’s Workingman’s Exchange, men gathered to mourn the loss of the world’s biggest schooner. Bartenders lined up looking for work at the US Employment Service at 116 N. Dearborn. Most bars didn’t close, they started serving other things. The Lasalle Hotel bar served a buttermilk frappe. Other bars introduced “Loganberry highballs,” phosphates and ice cream sundaes. It took 60-75 pounds of ice to freeze one gallon of ice cream, and Chicago consumed 5000 gallons of ice cream that summer—creating an ice shortage in a very hot summer. (It had already been a small harvest of ice the previous winter, and many warehouses were empty). On July 6th, bars opened on Sunday for the first time in many years. Ladies who had never entered these bars before showed up and ordered the new sensation on the menu…sundaes. Of course, Prohibition ushered in the beginning of the Roaring 20s in Chicago; a time of unprecedented crime and vice. The people that pushed Prohibition through (while many of the young men that would have voted against it were serving overseas in World War I) never would have envisioned the detrimental toll it took on the country, and the city of Chicago in particular. Al Capone became a celebrity in Chicago. Yes, he was a thug and a murderer, but he supplied the liquor to a town that had been one of the beer capitals of America. When Al attended a few games at Wrigley Field during Prohibition he was cheered. 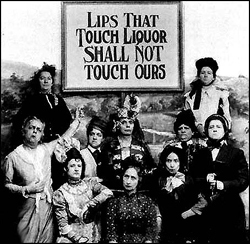 Prohibition lasted for 13 years, and during those years the Cubs led the league in drunks. Rabbit Maranville, the manager of the Cubs for part of the 1925 season, played with a flask of whiskey in his pants. Pat Malone & Hack Wilson were wild partiers that were arrested after creating several disturbances. Both men died young thanks to the ravages of alcohol. Grover Cleveland Alexander actually passed out drunk in the Cubs dugout during a game. Catcher Rollie Hemsley was arrested for public drunkenness.